Life initiates some of us in an instant. The loss comes out of the blue. A relationship ends. A loved one dies. Someone we thought would be in our life forever goes away. Or the doctor tells us we’re going away. Other losses unfold slowly. Eating disorders, alcoholism, addiction — even Alzheimer’s disease — can hide in plain sight for years. No matter what you face, you’re not alone although you may feel alienated from the world. Whatever your loss, other people have gone through it too. On the other hand, you’re unique and different. While others not in grief go forward full speed, your personal velocity changes. Full speed? Ha! You’re barely crawling through Life. It’s all you can do to get out of bed. Holidays can be dicey for people going through grief. While everyone else is eating, moaning, grumbling about required family appearances, or watching football, some people are in their own world — remembering when someone they love was there — skin on, for everyone to see and hear. But this year, the person’s absence is profoundly noticeable. Other holidays go better…. 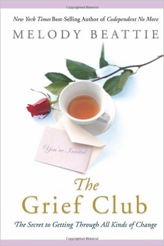 In this Grief Club Forum, ask questions, make comments, take part in conversations, tell your story (over and over if you need to – obsession is a necessary stage of grief and is allowed here). We invite friends of people in grief to take part in everything we offer. Read the articles for grieving people and articles with information that specifically applies to you, such as what not to say and how to be a supportive friend. Welcome to the forums. Say hi and introduce yourself. Loss of a spouse or lover? Has anyone else lost their kids through addiction? Solve the Word Search Puzzles by finding and circling all words on the list. The leftover letters in the puzzle form a Mystery Sentence — a message from a Melody Beattie book. Enjoy — whether you play for fun or a distraction.